Lenworth carries a wide array of loading dock accessories to improve safety, efficiency and maximize equipment lifetime. We offer a wide range of loading dock products, and we’re proud to offer sales, service, maintenance and more on all types of loading dock accessories in Greater Toronto and the surrounding area. To learn more about how loading docks and their accessories can help, see our article on Understanding Different Types of Loading Dock Levelers. Fill out the form below or call 1-877-769-0630 to get sales, service or more information on loading dock accessories. Worn out, damaged or misapplied bumpers can cause long term damage to concrete at the dock, to your equipment and to the building’s walls. Traditional cheaper bumpers wear down due to normal loading/unloading operations at the dock but steel-faced bumpers will save you in the long run due to the engineered design that provides a solid steel plate at the front, while absorbing the shock of trailers backing into them. 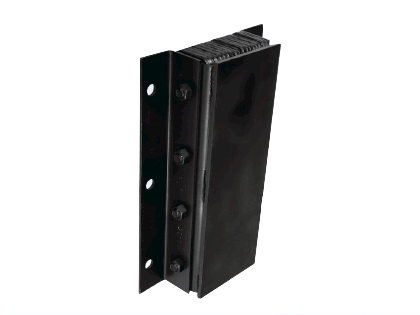 Get the strongest form of loading dock impact protection with our steel-faced bumper; for use where severe abrasion from up and down trailer movement is experienced (air-ride trailers, yard jockeys, etc.) and in any material handling application where the greatest dock protection is required. The “gliding” heavy-duty steel face of the bumper is independently anchored with elongated holes, allowing the bumper to compress AND offer high surface abrasion resistance. The bumper is fastened to dock surfaces through its 1/4″ steel side angles and/or flat plates, depending on the model chosen. The standard model comes with angles on both sides of the bumper for solid anchoring, and the bumper can be mounted horizontal or vertical (vertical generally offers the best protection).